A week after I returned from California, I read about the heat wave in NorCal (started late last, early this week)...the HEAT in Sunnyvale, California was as high as 106F (40degC!!!). Talking about being at the right place at the right time. Well, though we escaped the heat wave in NorCal, the weather in Taiwan is not any better. Singapore too, I think? Spring is officially over? Nope...as I'm bringing you Spring Onions...and another way you can further release the aroma of spring onions before using them in cooking and especially for salads. 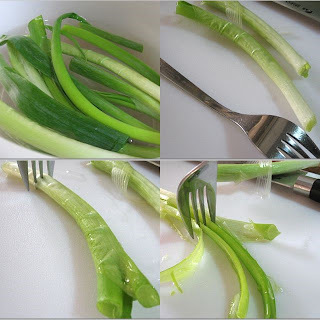 Use a fork and from the edge of the spring onion, start "scraping" them, as shown. You will get long thin strips even without using a knife. You make less cuts with your knife. You just slice to the length you desire. The trick is not to save you time or steps in slicing or julienning. It is to release the aroma, or if you think it is pungency...that you dislike - you can do the "freako" thinking and turn it to a way to remove pungency. Make a few "scrapes" and then soak in ice-cold water bath for a few minutes. Then it becomes easier to use in salads when the sharp biting taste has been partially removed. Spring onions are the most pungent tasting of young onions (spring onions > green onions > scallions, in the scale of pungency) with more biting taste than green onions. Note that the longer they are allowed to mature, the sharper the taste they gain. 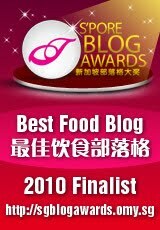 So if you really want to use spring onions in salads or cooking, make sure its flavor does not overpower the other delicate flavors. Weekend Herb Blogging is back with Kalyn's Kitchen this week and I'm hoping to share this tip and trick. Similar concept applies to onions. Here's how you can cut an onion to reduce an onion's pungency. Also, a reading source where you can learn to differentiate spring onions, green onions, and scallions. Finally, a condiment I made before - using green onions and minced ginger姜蓉. A good dip for poached chicken.